Our Best Price Mailbox Rental Coupon Special Offer! Our Best Price Shipping Services Coupon Special Offer! Our Best Price Photocopy Services Coupon Special Offer! 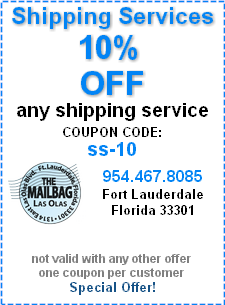 The Mailbag provides US mailbox rentals, mail and package receiving and forwarding, luggage shipping, along with worldwide shipping and packaging services from Fort Lauderdale, Florida. With over 700 mailboxes we are one of the largest USA mail box rental stores. We also offer a full line up of exceptional mail box shop convenience services including local, USA and international Fed Ex, UPS, DHL and USPS shipping services. Be sure to use our special discount coupon offers where they apply!